Life often looks so very different than we hoped or expected. We were so sure the path we were on for job, family, relationships for life... was just the way it was supposed to be: our Plan A. Then suddenly everything changes. We feel disappointed and disillusioned, and we quietly start to wonder about the reality of God’s goodness and what we thought was His plan for us. How should we respond when our lives turn so radically different than we ever imagined? #1 - In this broken, imperfect world, we often live out ____________________ . Or at least that's the way it feels. (1) our plans. (2) our relationships. (3) our families move away. (4) we lose our loved ones. We ask "WHY?" Underline "scattered." Many of these Jewish families lived in Jerusalem for generations - going back 1,000 years. Now persecuted. Run for their lives, leaving all they knew behind. Surely they asked "why?" In our heads we understand that we live in a broken world and that God is/will redeeming it. But in the meantime we just feel often like all our plans/hopes/dreams/desires aren't the way they should be. Lysa TerKeurst wrote book, "It's Not Supposed To Be This Way." Life can look so different than we expect. Some events catch us off guard. Some shatter us. What do we do when God's timing seems questionable? His lack of intervention hurtful? His promises doubtful? 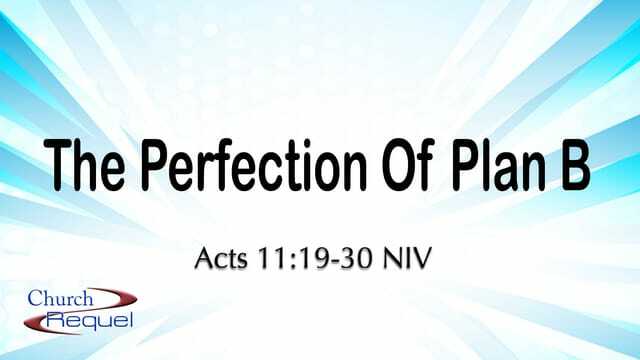 In this sermon 1) affirm God's good purposes prevails, 2) How we respond to Plan B, 3) leave you with some good news about Plan B. #2 - It may feel like Plan B to me, but God's purposes are never __________________ . These Jewish Christians are forced to relocate. Some go to Antioch. Eastern tip of Mediterranean. Secular city. City ranked 3rd in Roman Empire (behind Rome, Alexandria). Political intrigue. Cults. Sensuality. Sometimes our plans/wishes/desires don't work out the way we want them to. We end up living in a place we didn't intend. We end up with neighbors we didn't want. We're surrounded by a culture that doesn't have the same values as we have. "God, why? What's happening?" Know that even when we feel like we are living Plan B, our God has not left us, forsaken us. His power is not gone. "The Lord's hand was with them." Greeks (non-Hebrew people) were coming to Christ! And not just a few. "A great number of people." #3 - The key to living out Plan B redemptively is ____________________ . If we don't struggle with it, then we (A) are forcing our disappointment down deep and not dealing with it, and (B) aren't really being effective w/ those who watch our lives, and even worse (C) are faking it! A. Look for ______________________ . Ok God, I know you're working all things together for good. I know I love You. I believe I'm called according to Your purpose, so what's going on here? What's YOUR plan? Barnabas arrives and sees God's grace. He is glad. He encourages. And notice "them all" - not just the Greeks. The displaced Hebrews. He is a reminder that God is doing some really good things in Antioch! When your life turns into Plan B, look for God! Look for what He is doing! B. Look for _______________________ . If God is redeeming this moment, maybe I can partner with Him and find a hidden opportunity too! C. Look for ______________________ . Christians literally means "of Christ." These people, those Greeks joining this new faith were "of Christ" now, so they were named Christians. It wasn't Christians who named themselves. It was the outsiders. It may have even been said with derision. Their attitude? Let's own this! And our name was born! This isn't just a matter of the right PMA, of turning our frowns upside down. No one wants a fake celebration. But the truth is there IS reason to celebrate, if we can be flexible and faithful to find it. #4 - Ultimately the Spirit of God transforms Plan B into __________________ . Famine was coming to Jerusalem. Those still living there will be facing starvation (also a definite Plan B, right?) But no one (other than God) can see that coming. God turns Plan B into Plan A. Send Jewish Christians out. Make many new Christians. Take care of the Christians back home. Conclusion: This sermon is easier to preach than to live out. We have to know in our heads that God is good, His purposes prevail. Then we have to be purposeful to discover it, believe it, and live it out.